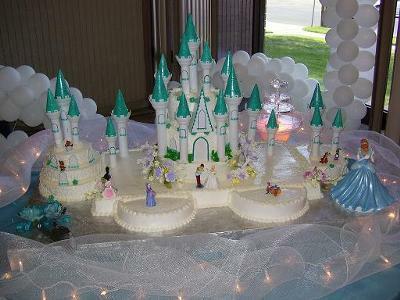 This fairy tale cake consists of 17 cakes. There are 3 half sheet cakes, one side has 10, 8 and 6 inch round cakes. The other side has 10 and 8 inch round cakes. It is topped with velvet topping and buttercream and the kit of princess by Wilton. Wow...........I feel like living in that palacce. Love it... Thanks for sharing with me. This cake is georgeous! Truly enchanting! Way too beautiful to cut! I'm sure that the little girl that had the birthday truly felt like a princess. I applaud you.........Very well done!